Ace Hardware is working the online holiday marketing with a fun online Flex application called Ace Your Face. 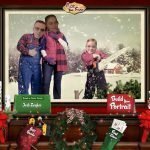 The app allows you to upload photos and work your face into different holiday scenes. I spent some time toying with it over the weekend and had a lot of fun. There are options to create holiday scenes with up to four people. Be sure to turn up the volume, the commentary is pretty funny. You can view the card I made by clicking here: http://aceyourface.acehardware.com/ace/index.jsp?cardKey=W21rgGkYcjs%3D. The Retail Studio at Resource Interactive worked very hard to make this project a success. A ton of time and effort went into producing the audio and creating the Flex modules. I even had the opportunity to help out with this by setting up the faces on the backgrounds between other projects. Ace Your Face at http://aceyourface.acehardware.com!